Here's a start, new (better) camera on the way. Bought her from the original owner a couple years ago. Mighty-mites not my first choice but she's all original, so I'm leaving her alone. Chris, any idea of the year? Brass nut, Coco headstock (I think), Walnut body, Mighty-Mites, checkerboard binding, Schaller tuners. A stunning guitar by any standards!!! Hey Daisybat! Thanks for the post. 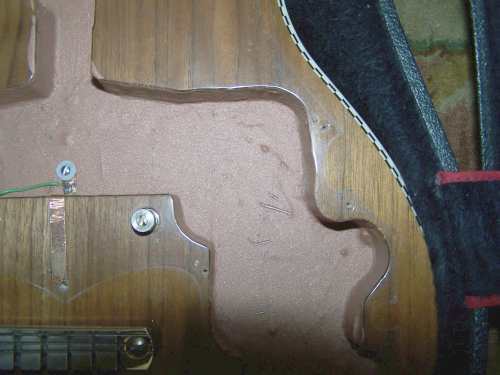 I remember this guitar because of the unique heartwood pattern on the back of the body. Beyond that, I don't remember where it went or who bought it. The headstock wood is Ebony and not Cocobolo. The #12s [i.e. Artist] model all had Ebony or were painted maple. I'm thinking this is around 82-84 because of the Mighty-Mites. This is certainly one of the last GS guitars built, and one of the most beautiful black walnut GS-12s made. Gibson hourglass truss rod cover vs newer Time cover. Regular strap buttons vs newer strap locks. Les Paul style pickup selector switch vs new Alcoswitch selector. Older Times had hex nuts on all the switches. The newer switches all had knurled nuts for a more finished look. Newer GS's had a contour cut in the upper back of the body. You know for your gut! This contour was suggested by the great Knobby Reed. Hi, Chris et al, thanks for the info. #106 has all the earlier specs plus the contoured back. Also I see #111 on this site is listed as circa 1978. Not sure how the serial numbers run - any ideas? What constitutes "early"? Got my better camera to work so here are more shots. I purchased the guitar from Peter Condaxis, a forester in Calais, Vermont who told me he bought it straight from Alan Stack but couldn't remember the year. I have about 40 guitars now (yikes!) and this one is closer to mint than any of the others, really almost unplayed. The volume pot suffers from scratchy syndrome, otherwise all good after 25-30 years. Finish amazing, design flawless. If there's ever a Time museum this one should go in it! CC - does your bro drive a Land Rover? Met him last year, nice fellow. What a small state!!! This guitar is 'early Barn' and a couple of things are puzzling for me. Your pickups are from the barn and the #111 GS has the Gibson Humbuckers. These were the 1st guitars coming out of the barn, I believe. I also own a mahogany GS-9 that has pickup covers like yours and pieces similar to #111. I have a few days vacation coming up and this guitar needs a repair on the selector switch. When I have it open, I'll get the serial number and take a few pictures as well. Also puzzling, are those straplocks on there? And does this have a relief contour carved on the back? A couple of other things date your guitar. 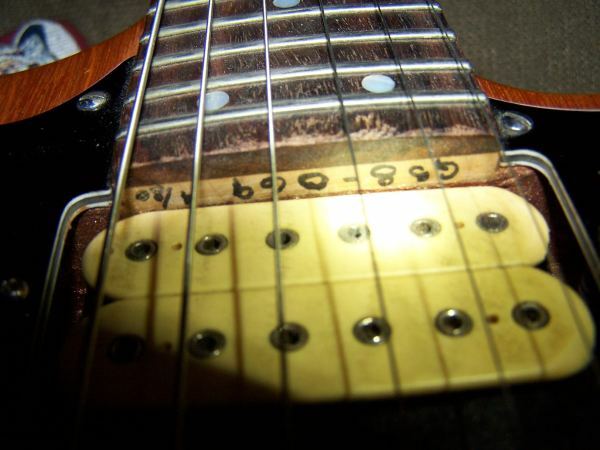 The single ivoroid binding on the headstock is older. Later guitars had matching body and headstock bindings. Also the heel craving is 'fatter'. Alan always craved the fatter heels. I started craving the heels starting at Darrell's music. I started out with the 'fatter' style and gradually made the heel craving slimmer. If that makes sense to anyone. Check this picture in the 86 brochure. Scroll down to the 'Dovetail' pic. This is what I mean about the 'slimmer' craving. I thought about your guitar and that Black Walnut last night. There maybe a 'twin' or 'triplet' of your guitar out there. I remember us doing a group of Black Walnut GS-12s. The other ones had the stripe body binding. Usually when you had Black Walnut lumber with that heartwood, it was in the log for several feet. Enough to get several bodies like yours. Wow! Forty guitars! Any more Times??? I have a much smaller collection and still have a hard time finding places to store them. My wife only let's me buy Times now. Nothing else! And yeah, that's my brother Lanny. He lives on what was my parents farm in Colchester and makes a living restoring vintage Land Rovers for the well-heeled folks. And again, thanks for the post. This exchange is really what this site is for. Time to finish wrapping presents! Happy Holidays all! Last edited by Chris on Sat Dec 27, 2008 2:06 pm, edited 1 time in total. Hi Chris, no those are just big long strap buttons and yes, it has the back contour. Hard to see in my pix but it's there. The guitar weighs 9.71 lbs even with that carve! Yeah, it's too many guitars, but I decided to invest in old wood a couple years ago when my mom died and what with the stock market going the way it's been I think I did the right thing. Unfortunately she's my only Time; almost bought a mahogany GS-8 or 9 a year ago, think it might still be for sale. I can find out if you like. Think it was the one on craigslist. A Burlington fellow has it. No micro switches, SD replacement pickups and the original Mighty Mites in the case as well. He was looking for $800 at the time. Hey, have a great holiday too and if you ever want to meet up and share guitar stories I'd love to at least shake your hand and say "Thanks" for your part in the creation of such cool instruments! That GS-8 sold within days! Weenote got it hours before me. Weenote invited me to see his band down in Cambridge, MA last month. I've been doing engineering work down there for Harvard and MIT since 2007. He had the original pickups put back in the it was really nice to see and hear a Time again. Plus, I got to leave the hotel and do something fun. I'd love to trade stories with ya and see your GS. PM me. I'm in Vermont for the next few weeks. More about your guitar... I'm now think'n that it came back to us for the carve or it was in a batch that had to be refinished and it sat in the shop for a few years before going out. Alan was using a poly 2-part finish in Darrell's basement. Aside from making us all sick, especially SollyDad, the finishes also had problems with adhesion. We had to strip a number of finished guitars and start over. We went back to using lacquer after that short experiment. When I see your guitar, I'll know. I remember the run of that particular walnut. The lighter streak was actually considered a 'defect' but when bookmatched produced a handsome body. It was the same for the streaks in the ebony. Alan's sales pitch was that it was special and I agree, as it ads interest. 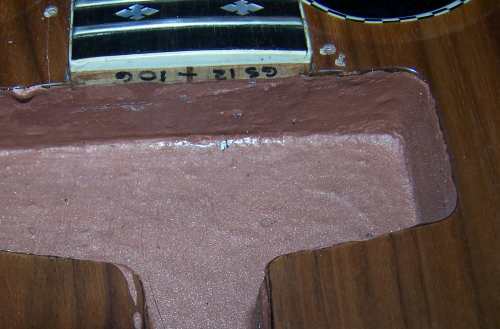 We used a conductive copper paint to shield the pickups before the copper foil was used but I don't recall the switchover date. I left in '81 or '82 and I think the last SN I worked on was #149. Whatever number, it was written with an ink Pentel type pen. If anyone opens your Time up daisybat I'd love to get a look at it if it's OK with you. Thanks for the input. I think we both recall peculiar guitars by remembering something unique about the wood used. I was able to lower the pickup enough to get this shot. This is GS-8 069 4/80. Having the date on the neck was rare. That's my handwriting. The guitar is really a GS-9. You can see the copper paint in the cavity in this shot. When I talk about damaging the foil by pulling the pickguard, I'm really talking about the foil that's applied to the pickguard itself. All the Time had a conductive paint in the pickup cavity. At some point we switched from copper to a gray graphite paint. The date and the number also tells us that Alan, John & I got really serious in the Barn and turned out 80 guitars in less than 2 years. This guitar has a short in the wiring and I'll be opening this up to repair soon. I'll take pictures. Since this is one of my 1st wiring jobs, I hope it doesn't look too horrendous! Those really look like Dunlop original strap locks on your guitar. You're just missing the strap parts. These were the 1st straplocks used at Time. Eventually, we switched to Schallers. Strap locks became standard after Comic Joe's accident. Here's a picture from Musician's Friend. Re: GS-12 #106 Under the hood! Eros stopped by my house a few weeks ago and we took apart his GS-12. And yes, this guitar has the straplocks pictured above. Here are a few photos of the inside. Here is the spot to check for the serial number. Sometimes these will have the date written in also. Note that many guitars finished at the barn had started construction before moving to the the barn. 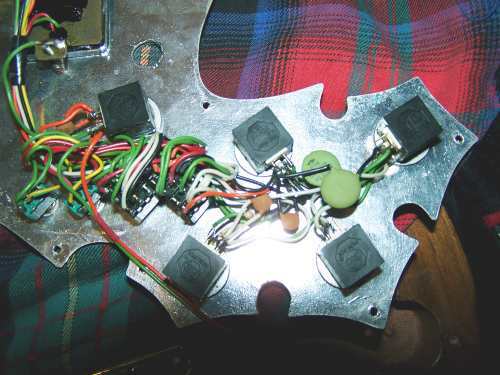 Here's a picture of the business end of the tone switching and volume & tone controls. Neck coil drop, bridge coil drop, master phase, and mater parallel/series switching. Old vs new routing for the GS guitars. Here is a comparison of the 2 routing styles. The 1st is my own natural mahogany GS9 #69 dated 3/80. The newer one is Bill Simmons' brown-shaded GS9 #152 dated 1/83. Eros' GS12 #106 has the early routing style. If anyone is interested I have will be posting all the part numbers and current sources for these components. Yesterday I took apart my GS9 to see why the switching is all screwy and found out that someone had messed with this guitar years ago [I got this guitar in 2000 and haven't touched it.] Someone had replaced the switching and screwed up the coil drops and P/S switches. When I have time, I'll rewire this guitar back to the original spec and post my progress and the schematics. I can also see putting this post in the 'How they were made' section.